Hope and Dreams (HANDs!) Project is an annual youth exchange program, aiming to nurture a sense of common feeling and coexistence as a community shared by the people of Asia, initiated by The Japan Foundation Asia Center. HANDs! promotes dialogue and exchange among youth in Japan and Asian countries in order to deepen mutual understanding. HANDs! also promotes the formation of a network among young leaders, as well as promotes collaborative efforts among them, in the field of intellectual dialogue on disaster and environmental education issues. The HANDs! Project will connect youths, from Japan, Indonesia, the Philippines, Thailand, Malaysia, India, Myanmar, Nepal and Cambodia. 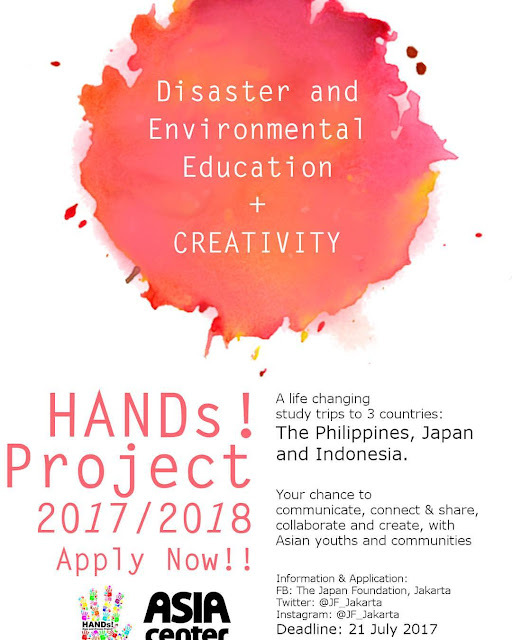 These youths will be given a trip opportunity to learn about disaster and environmental education in Japan, Indonesia, the Philippines, and also a chance to have collaboration to create projects for the community in the second year. The youths are the agents for change that determine what the future will be. In Asia, the wave of young people’s participation in giving social contribution is growing fast in various issue-areas, including disaster and environment as major issues faced in this region. With dreaming on a strong bond of friendships between Japan and Asian countries and hoping on the fast-growing youth participation, the Japan Foundation Asia Center provides opportunities for youths in Japan and Asian countries to learn from each other, to inspire one another and to seek for seeds for collaboration through HANDs! Project. What am I going to do within HANDs! Project? The trips will consist of site visits, lectures, and workshops. During these intense trips, participants will learn to develop action plans in disaster and environmental education to propose to the Japan Foundation Asia Center. If approved, they will be given support and seed funding to kick start their plans in 2018. Therefore within HANDs!, the participants are not only expected to self-reflect and undergo personal development, but to also take action, as symbolized by the HANDs™ logo: small, colourful hands forming a larger hand. The logo shows how young people from different cultural, social, and economic backgrounds can work together hand-in-hand, to take action, tackling common issues that we all face. Applicants have to be: a young professional who have great creative skills and/or organizing skills (creative worker, social worker or journalist) with at least one year of working experience or an active university or graduate student (who presents valid student ID). Applicants must have records of activities in the field of community building, desirably disaster and environmental education in their home country, such as conducting educational events for school children, helping post-disaster reconstruction, conducting social enterprise, etc. Applicants who worked on other social issues such as supporting children, handicapped & elderly, in deal with LGBT issues, women’s empowerment, and others are also encouraged to apply. Applicants who are eager to learn from other countries’ experience of post-disaster recovery and disaster preparedness. Applicants who are open to new ideas and methodologies. Applicants who are willing to challenge oneself and willing to try out new settings for creativity. Applicants who are passionate for creating his/her own follow-up project (individually or in a team), in collaboration with the Japan Foundation Asia Center. Applicants must understand and agree to the aims of HANDs! Project. Applicants have to be equal or under 35 years old, as of the date of application (July 21, 2017). Applicants must possess the ability to conduct formal conversation in English and a good communication skill. Two samples of recent works (in English or Bahasa Indonesia), for example poster designs, comics, product designs, photography, web design, short essays, newspaper articles, journals, video, etc. Any additional material (in English or Bahasa Indonesia) about your disaster and environmental related activities or other social activities, for example poster designs, comics, product designs, photography, web design, short essays, newspaper articles, journals, video, etc. "HANDs – Young Professional / University Student - Applicant’s Name"
*The whole documents should not exceed 5MB, we will not accept documents larger than 5MB. For video files (if any), please upload to Youtube and send us the link. Strict rule applied: failure in submitting your application by the deadline will be automatically disqualified. Strict rule applied: failure to complete the required documents for application will be automatically disqualified. Learning from our past experiences, please DO NOT wait until the last day of submission to submit your application. Usually, most applicants wait until the last day so that our E-mail system crashed because of receiving a lot of documents at the same time. IF we’re NOT receiving your E-mails then we WILL NOT screen your application. Please, the earlier the better. If you have any questions or concerns about the application process or the HANDs! Project, please contact HANDs! Project Desk in Indonesia (contact below) or e-mail our Assistant Project Manager, Mr. Purwoko Adhi Nugroho, adhi@jpf.or.id. **For citizens of Japan, Philippines, Thailand, Malaysia, India, and Cambodia, please contact the Japan Foundation regional offices in your respective countries. ***For citizens of Nepal, please contact the Japan Foundation New Delhi, and citizens of Myanmar, please contact the Japan Foundation, Bangkok.